Ride Height: The space between the ground and specified chassis points of the car. You need to choose at least three hard points on the chassis to measure. Two points up front and one in the center of the rear axle line. The chassis points you want to choose are those that do not get banged up on curbs, and therefore their dimensions are not changing. Rake: This is the difference in height between the front of the chassis and the rear of the chassis. Positive rake is when the front of the car is lower than the rear of the car. On a Porsche, you never want negative rake from an aerodynamic standpoint. Cross Weight: The goal of corner balancing a car is to adjust the cross weights to be as close to 50% as possible. Cross weight is the total weight on the right front (RF) and left rear (LR) tires. 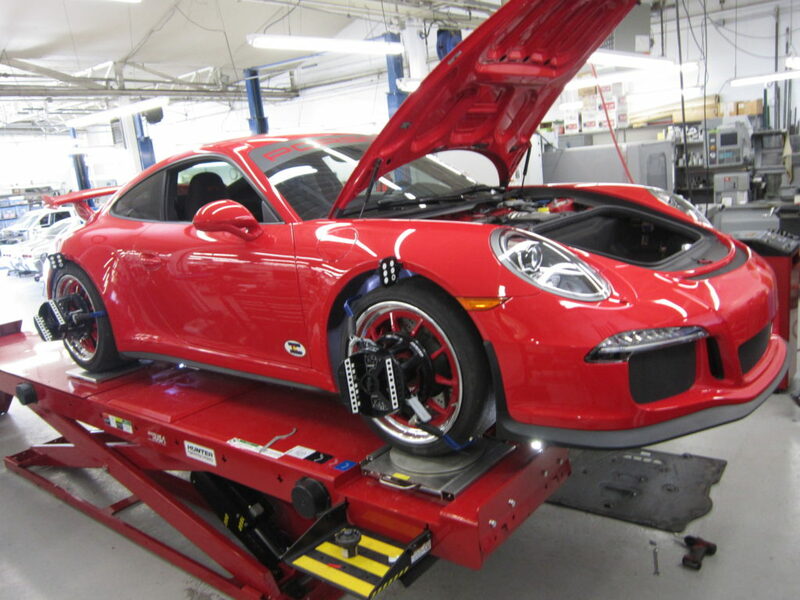 From the factory, the corner weights on most Porsches are not adjustable. On the plus side, they are pretty well balanced with the generic 180-lb driver in place. If you have installed adjustable spring perches, then you can get the cross weight to exactly 50%. This is achieved by moving your spring perches up, or down. Raising a spring perch increases the weight on that tire, and vice versa. Balanced cross weights allow a car to handle the same regardless of direction. Caster: This is the angle from vertical that the pivot axis of your front tires is leaned. When the top of your strut is behind the axle centerline, this is referred to as positive caster. 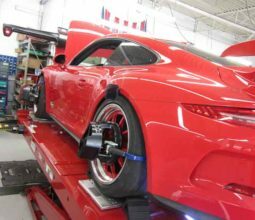 Again, from the factory, caster is not adjustable on most Porsches, but if you have installed caster/camber plates at the top of your shocks, this is an adjustment you really want to take advantage of. Caster dynamically increases camber while turning, and on the track you almost always want more caster than you can get. It also helps the steering rack return to center when coming out of a turn. A shopping cart is an example of extreme negative caster, with the front wheels being very twitchy, while a top-fuel dragster is an extreme example of positive caster as they need as much help as possible keeping the front wheels straight, and heading down the track. Camber: This is the angle from vertical that the wheel and tire are tilted. When the top of the tire is further in towards the center line of the car than the bottom is, this is referred to as negative camber. When camber is correctly set, it gives the flattest contact patch while cornering, thereby improving grip, and helps keep the tire temperatures even across the surface of the tire. Toe: This is the amount that the wheel and tire point in, or out, from straight ahead. At 3R we measure toe in increments of 1/32″. Production cars are intentionally set-up to push for the safety of the average driver. This means they come from the factory with some front toe-in. For track use, or even spirited street use, some front toe-out is beneficial because it helps the car change direction quicker. On a rear engine Porsche you always want some toe-in at the rear, although less than stock, due to the engine weight and propulsion being at rear wheels. Toe changes are the biggest adjustment that a driver can feel over a stock set-up. Zeroing Anti-Roll Bars (ARBs): Once all your other specifications are set, it is time to zero the ARBs. You need at least one adjustable end link on each ARB to properly zero them. The goal is to reconnect the end link to the ARB without changing the cross weight you have so carefully balanced.